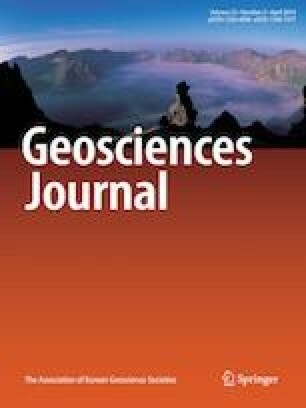 Major and trace elements, including rare earth elements (REEs) geochemistry of bed sediments from the lower reaches of Krishna river suggest their origin mainly from weathering of Deccan basalts and Precambrian rocks of the southern India. The elemental compositions indicate evidence of sedimentary sorting during weathering, transportation and deposition. Highly depleted Na2O and high values of Chemical Index of Alteration (CIA) are suggestive of moderate to strong chemical weathering environment in lower reaches of Krishna river. Major, trace and REE concentrations of bulk sediments suggest marginal variations in relative contribution from mafic and felsic minerals. The bed sediments contain significantly low concentrations of trace elements like Ba, Sr, La, Ce and Nd and moderately low concentrations of V, Zr, Rb, Zn, Ni and Cr relative to upper continental crust (UCC) composition. Most of the other trace elements and REEs are almost similar to UCC indicating their origin from weathering of mixed rock types in catchment areas of Krishna river. Strong relationships of ΣREEs with Ti and Zr in bed sediments suggest that REEs are mainly controlled by heavy minerals such as titanite and zircon. A marked increase in REEs in clay fractions of sediments indicates their adsorption and/or substitution on clay lattice. The first author (ABK) is thankful to Science and Engineering Research Board of the Department of Science and Technology (DST), Govt. of India as this work was supported by the DST grant No. SR/FTP/ES-105/2014. The laboratory facilities provided by the Director CSIR-National Geophysical Research Institute, Hyderabad, India are thankfully acknowledged. We are grateful to Dr. C. Manikyamba, Mr. Netramani Sagar, Mr. Santosh Kumar Beja, Dr. S.S. Sawant and Dr. K.S.V. Subramanyam for their support and assistance during the course of this study.